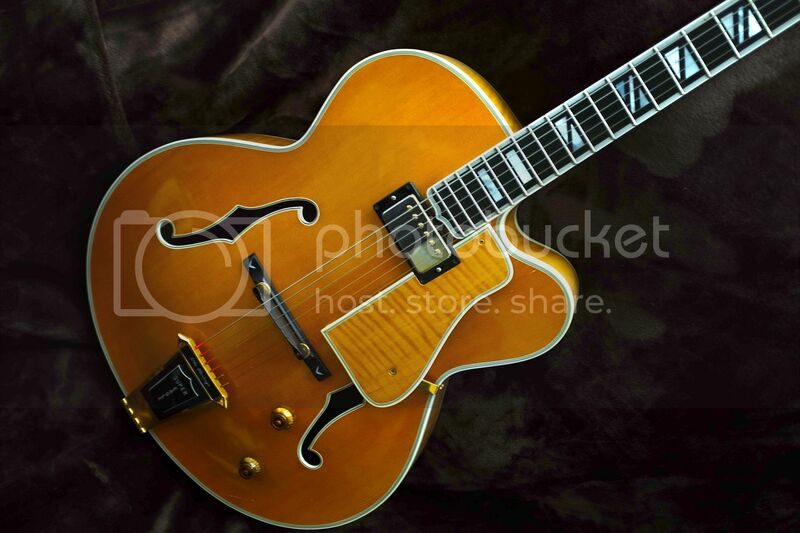 It is a shame that Japan is no longer very active in the archtop market besides the Ibanez GB & PM. The only GB model I ever liked was the GB20. The Japan made archtops were always top notch in build quality at a fair price. Ibanez lawsuits, Vestax D'Angelico's, Fender and Aria D'Aquisto's, Epiphone Elitists to name a few were all great axes. Sorry but nothing coming out of China or Korea floats my boat. Sorry to all you Eastman fans but never heard one of those either that sounded good to me. Let's face it, American made archtops are getting beyond the price reach of many players so it would be nice for Japan to get back into the game and offer that mid level price range quality made archtop to the working musician. I know that Japan used poly finishes too but I had a couple of Japan made axes that sounded really awesome for the price. A middle ground choice would be nice again. All Pro-Line Gretsch models are made in the Terada Factory. You may not be considering a Gretsch but they are archtops made in Japan and the workmanship is excellent. Seeking beauty and truth through six strings. The joys of manufacturing are that plants go where labor laws are weakest and wages are lowest. Japan's labor costs are comparable to the US, so the cost of guitars produced there will tend to be comparable. The top drawer PM and GB Ibanezes aren't quite as expensive as Gibsons but not way off. There are still great archtops coming out of Japan. Ibanez, Tokai, Seventy Seven, D'Aquisto/Sadowsky among others. I agree with you about eastman. Many folks here love them but I've never bonded with any of them although I do love their semi-hollows. The new GB and PM list for $5k so you're right there. They are almost as expensive as a Memphis 175. I'd rather have the gibson though. I've owned quite a few japanese bensons and metheny guitars and IMO, they do not quite achieve the level of the Gibsons in terms of tone. Yes the Terada Factory has always made quality instruments like the high end Gretsch but I am not a whammy bar kind of guy. Cunamara you are right. You just answered why the lack of Japan made archtops and why everything is being made in Korea, China, and Pakistan. Corporate greed is global. Made in Japan in the 1960's was what made in China is today. Arai, like other Japanese manufacturers had begun bringing in skilled engineers and popular players to influence the design of their guitars. The "new" Aria pro II line was produced by Matsumoku. Quality was improved considerably and the models sported unique and innovative designs. Many models came stock with phase/series-parallel/coil-cut switching not commonly found on other guitars. Other innovations included active power boosts and unique tone circuits. Matsumoku's attention to quality and construction techniques soon began to attract people's attention and the line had easily jumped from entry-level to intermediate and even pro quality instruments. At the top of the line were the PE Prototypes which appeared in 1977. Many of you have seen some of them as the PE "Masterpiece" or "The Aria Pro II". Many other high quality models were introduced, and for a decade, the Aria Pro IIs continually remained at the top of their class! Other notable models were the Thor Sound, Tri Sound, Noise Killer, Cardinal, and RS series . Matsumoku not only produced the Aria Pro II guitars but a number of other well known brands such as Vantage, Westone, Electra, some of the Japanese Epiphones, and the Japanese Washburns. The most notable of the Vantage line were the VP and VS series incorporating many of the same electronics features as the Aira Pro IIs. A number of neck-thru models of extremely high quality were produced and still command prices worth respect. Electra production began in the mid '70s and also bore the same high quality and features but took electronics and decoration one step beyond. Features such as active power boosts, active EQ, MPC on-board swappable effects, fancy inlay work, and even faux tortoise shell binding appeared on a number of models. The MPC models (a complete line by itself) were unique in that up to two effects modules actually plugged into a compartment on the back of the guitar and were controlled through the use of universal controls on the front of the guitar. Modules could be swapped at will and a number of modules were available. Westone (as well as Electra) were distributed in the US by Saint Louis Music. Westone was also distributed in the UK and some models actually debuted there before they hit US soil. The two most impressive of the Westones were the Prestige and Session II. Quite a few different models were offered including the Spectrum series, Dynasty, Dimension, Concord series, Pantera series, and Raider to name a few. A number of other guitar brands were also manufactured by Matsumoku, some documented and some not. As time goes on, some are spotted and at least partially identified. Such is the case with the mysterious Skylarks. The Japanese Washburn Wing series as well as the Japanese Epiphone Scroll can be credited to "Uncle Matt"! Production continued at the Matsumoku plant until the latter part of 1987 when, due to production costs, manufacturing was moved to Korea. Shortly after, the Matsumoku plant was sold to Singer and all guitar production ceased. If I understand correctly, the plant was destroyed some years later in a natural disaster . Several of the names survived or have been revived originating from Korea and the UK. Aria Pro II and Aria as well as Vantage and Epiphone are now produced in Korea. Westone has been revived and several models are available in the UK and sport much the same looks as the Prestige which it is modeled after. Aira/Aria Pro II continues to live on and the model line has changed and expanded considerably to meet present day demands. Guess I am living in the past. I bought a new Epiphone Elitist Broadway when they came out brand new for less than $2K and it play perfect right out of the box and couldn't find a single build flaw. It came with 57 classics and had a great sound. Jack you are right. Sadowsky's are running close to $5k as is the GB300 & PM. I guess we will never see a middle ground anymore. Gibson is making regular 175's again and they actually have lowered their price. $3199 for a VS and $3500 for a Nat. That's the best deal out there right now. Of the custom builders in Japan, I would wager that Tsuji-san, Sumi-san, and Saito-san are the best-known. I think I forgot to include Ando-san in Hokkaido but I've mentioned him in a post before. As noted above, d'Aquisto are still made in Japan. d'Angelico's are also made and sold in Japan (Crews Maniac has the license). Also as noted above, Seventy-Seven, Sadowsky, Ibanez, Yamaha are still made in Japan. A couple of Deviser's other brands (other than Seventy-Seven) also make really nice guitars, and occasionally archtops. Yamaoka makes them too. One store makes Archtop Tribute archtops at Terada. Fujigen makes a bunch of things for people, including their own brand. Landscape is another brand out there made in Nagano. Tom Ribbecke has one guitar line associated with his name made in Japan - Kiso Ribbecke (the KR-1 is a guitar). Going back awhile, in addition to those mentioned here and above there were Greco, Aria, Teisco, Ornett's, Moon, Chaki, m.maker, T's Guitars, Taku Sakashta made an archtop or three, a brand called History (which was the shop brand for one of the big famous shops you see in Ochanomizu), another called Monogram, K.Yairi made some archtops in addition to flattop acoustic guitars, Suzuki, Kawai, Yamaki, Yamato, Burns, Daion and others also made archtops at the lower end. There were any number of other shop brands out there which I don't remember the names of. In custom-land, Sumi-san, Tsuji-san, Matsubara-san, and Ando-san will all make you a beautiful L-5-style guitar from scratch for less than they usually go for used in the For Sale section here (at least now that the USD/yen has gone back to its 20-year average they are 'cheap'). You can buy a beautiful 175-style guitar made by Archtop Tribute brand new for less than $1500 at the top of their line; a bit over $1k for the base model (poly finish). As to whether Japan will produce a Japan-original brand like Gibson for guitars, I kind of doubt it. There are not many of those guitar brands out there. And the world doesn't really need more of them. As to 'middle ground', how many American-made archtops are there which are in that 'middle ground' price range (at MSRP)? Not many I am going to guess. Westville represented by Walkin Jp is another. Check out Walkin FB's page. Nobody mentioned the Tokai FA245 ? Last edited by Jabberwocky; 08-04-2015 at 03:30 PM. I guess I stand corrected. They are still being manufactured, just not all being imported by the USA. It's kind of nice to have a high end Japan made poly archtop for those cold winter gigs. i would love to have an ibanez PM200 but they're rare in the USA, and I've never seen one used and $3500 compared to $3199 (or less for used) 175 is ridiculous IMO...The whole time I owned Ibanez PM-120s and PM-100s (i've owned 2 of each) I really wanted a 175. I felt like they were a poor man's 175 though all 4 played ridiculously well. Vinny and Jack, a couple of months ago after I scratched my L7c with an evil falling microphone, I decided to get myself something for around $1000 that I wouldn't mind messing up. For a little over $1000, I got an Eastman ar580. When I got it, Honestly, I expected a cheese fest to pop out of the case. Didn't happen. This guitar is an unbelievable value. Ebony everywhere. Flame maple bindings. Nitro lacquer applied to perfection. It plays very good. The sound surprises me. The neck is every bit as good as any neck I've touched. Gotoh tuners. Solid top. I'm telling you, for the money you can't get better than this, anywhere. When they figure out how to apply stain (not with paper towels) and do some quality toning like what was done on the teardrop Wusterpiece that is on the board right now, LOOK OUT!! Actually many Japanese guitars are finished in nitro although that is by and large the solid body models, Bacchus, Epi Japan, Headway, mamose etc. but those (like mamose) are seriously high end bits of kit. You could argue the price is high compared to a mercian stuff but imo they are far better than the American stuff so the value is still good. these are the models I would like to try that are coming out recently or models that are still available over the last decade or two. It seems that under Headway, momose makes the strats, Headway makes the acoustics and seventy seven makes the jazzers. Not sure how bacchus fit into this exactly as they do the same as momose but anyhow. I will agree that there is a distinct lack of 17" archtops coming out of japan but I think that is deliberate. Correct me anyone if I'm wrong, but the Japanese have never really liked 17" guitars. They have always excelled in the 16" and lower. Maybe something to do with size but at the same time, they also try to make guitars feedback lees and thus more practical. It seems the Japanese have been more convened with substance over style and this seems to b their direction of travel over the last 20 years. Obviously from this list i've left off the Sadowsky, D'aquisto, D'angelico etc. My eye is on the Seventy seven, FGN and Ibanez AF200 and tokai FA's. Greco seem to have disappeared off the map in the jazz world for some years. Many of the guitars shown above are finished in Nitro and are about $2500 new or slightly less and offer far and above the average output from American counterparts. are all still making top rate (and nitro) Es-175's and a couple of 17"s.
Last edited by ArchtopHeaven; 08-04-2015 at 06:20 PM. That koa Seventy Seven made me check my checking account. Thanks for the sweet pics Rich !!! Yes that koa is a super sweet looker. I'm such a sucker for koa...would love to have an all koa guitar some day. I have a MIJ Gretsch Synchromatic G400 (Terada made). The craftsmanship is absolutely superb. It's a great sounding guitar, I have a floating CC pickup on it. With bronze roundwound strings it has a nice acoustic sound, it has a nice low end 'thump' acoustically. Amplified it sounds great, with flatwounds it gets very close to the early Tal Farlow sound. It's also a very pretty guitar. Momose (note spelling), Headway, Seventy-Seven, Bacchus (and STR) are all brands run by Deviser. A bunch of them are probably made by/in the same factories. Deviser also has a few guitars out there under its own name but they are rare. I have seen archtops with Headway, Seventy-Seven, Deviser out there. There is an STR add with semi-hollows up on the For Sale section from time to time. The pic you note as "FGN?" is indeed FGN (the headstock marker on Fujigen's own brand). You can tell from the f-hole. Not sure when that dates from but they make some decent stuff (and still do). Love the Koa Hawk [drool]! FWIW... An Ibanez PM-200 (Natural) can be had in Japan for JPY 300k new if you get the sales tax rebated. That gets you to <$2400 + shipping - which to the US would be roughly US$200 I expect. Though there would be an import duty to protect American producers from nasty foreign producers who just want to drive them out of business. Yes the Terada Factory has always made quality instruments like the high end Gretsch but I am not a whammy bar kind of guy. Not all have the trems. My Anni doesn't have one, nor do some select models. Actually I knew the Deviser company was the parent company of those brands mentioned. I dont know why I said it was Headway, must have been late. Last edited by ArchtopHeaven; 08-05-2015 at 05:59 AM. After the details of my next purchase gets worked out, My Eastman 580CE will be in the launched position as i start my search for the most mint condition hand signed JP20 (yes made in Japan) that I could find for $2000. So Vincent and Jack, I stand corrected. Eastman guitars are really nice but for some reason, they just don't attach themselves to you like some other Guitars do..
> I am just thinking about the new generation jazz guitarist. How is he/she going to ever be able to afford a decent axe at these prices. There has never been a cheaper time than now to buy a guitar. Remember that your 1977 dollar is worth $4 now. A new kid playing guitar these days can pick up a pretty nice new ibanez or loar archtop for a hundred bucks or so in 1977 money. A hundred bucks in 1977 would buy firewood. Gibsons are the only guitars that have gone up faster than inflation, but there are lots of used ones available at reasonable prices (who buys new Gibsons?). FWIW, I think that Seventy Seven http://www.deviser-77.com/ is the new Gibson of the '50s. Look at the line-up of products and the craftsmanship shown in all of them. It might get more expensive, but it just doesn't get any better than this, if you asked me. Last edited by LtKojak; 08-05-2015 at 03:48 PM. FWIW, I think that Seventy Seven Home-??????????????????????????????????? - SeventySeven Guitars Official Site is the new Gibson of the '50s. Look at the line-up of products and the craftsmanship shown in all of them. My brain had already gone to bed too. Japan is a wonderful place to spend some time. For all kinds of reasons I imagine. You may be right that Japanese don't like 17" guitars, but I don't know. Japan likes jazz, but listens more and plays less, and when it plays, guitar is down the list in terms of methods of expression. Personally, I find that when I see archtops for sale in Japan, they are generally the 16+ to 18" size. If one goes to Ochanomizu or Shibuya or certain places in Osaka, what one sees which has been purchased abroad recently, or purchased abroad in the past and put on the local used market, is 17" size or style guitars though admittedly 175s are quite popular. I am surprised I don't see more Byrdlands. NEW guitars made by Japanese factories (Terada, Fujigen, etc) tend to be in the 16-17" range rather than the 17-18" range. Those made by luthiers tend to be 17". Japan loves a tradition. But archtops in Japan are rarer than they are in the US point blank. Any given store will have, well, none. If they have a store with 3-4 of them, they are almost specialists. There is no Japanese version of archtop.com (unless it is walkin's Facebook page). Last edited by travisty; 08-07-2015 at 12:45 AM. Nice Chaki JW! Zat yours? Is it for sale somewhere? Looks like a P-6 or a P-Special with a P-6 body (or possibly a P-80 but I didn't think they put that nice a headstock on those). Not mine, Trav. For sale at ƒgƒbƒv - ƒJƒƒZŠyŠí. Asking JPY200000. Thanks JW. I didn't know about this place (there sure are a lot of them) but they appear to be right down near Hoochie's. No word on what model it is. Archtop Tribute AT350Classic Prototype LAN???????????ITM0671273?J??????? ?Archtop Tribute? Looks beautiful. I've lusted after a single P90 ES350 for years! How do I BUY IT!!! i think I've heard of them before. Don't they make a guitar that has a Rose inlay in the pickguard and the headstock? Sounds familiar..
That Seventy Seven Tan Tan 17 looks awesome as well. Where do I find these?! No US distributor email listed. Great looking guitars though. I'd dive all over that tan tan17. Jazzman301, click on the word 'Email' and you'll get your email address. Note, however, that the TanTan was made for Guitarshiptantan outside of Tokyo at their request. You might only be able to get the stock models from Seventy-Seven directly. I would bet that if you really, really wanted a TanTan 17, you could contact them directly and get it sent to you. Because they deal in gypsy guitars and overseas-mase gypsy guitar parts, someone there would speak or write English. 230k is the price without tax. Last edited by travisty; 08-09-2015 at 12:20 AM. Just shoot them an email, they should respond. most sites on J-guitar will ship internationally. They have some weird pricing structure though but as long as you are happy with the end result. You can also try Walkin.jp they seem to stock them new for 50,000 Yen more. Last edited by ArchtopHeaven; 08-09-2015 at 06:31 AM. Could be. I´ve heard that they make every model as a lefty one aswell..Cant be true, right? That sound like Heritage I know. Whatever the customer wants. I am looking for a used Seventy Seven Hawk if anybody has one?